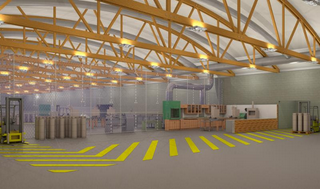 Formerly operating as the Alfred Ceramics Innovation Center, IncubatorWorks will now expand to a third location in Horseheads, N.Y., catering to advanced manufacturing tenants. Lead by COO, CFO Nancy Kirby Kurjakovic and Executive Director Alan Rae, IncubatorWorks is a resource for business startups and expansions. The new location is planned for the historic Schweizer Aircraft building at the Elmira-Corning Regional Airport. It will now provide startups with 47,000 square feet of office, laboratory and manufacturing space, as well as professional mentors, a state-of-the-art videoconferencing center, high speed internet and services such as 3-phase electric and compressed air. “What’s exciting is this building was closed for over 5 years. We met with George Miner, Head of Southern Tier Economic Growth who was struggling with what to do with the space, but we knew it would be the perfect opportunity for small companies to learn and grow. Plus renovating this site is 10-20 times less the cost of building something new. It was a win-win,” said Rae. As part of the NYS Governor’s Incubator Hot Spot and Startup-NY programs, tax incentives will also be offered to new companies at the site, in addition to research and entrepreneurial support from Corning Community College, Binghamton and Cornell Universities. “With close ties to local college business programs, community resources, and support businesses, we help guide clients through the process of establishing and operating their businesses correctly,” said Kurjakovic. Incubators in Corning and Alfred, N.Y. have been dedicated to early-stage, Southern Tier businesses since 1987. In the last three years alone, these facilities have generated over $10 million in sales and $21 million in payroll and benefits, paving the way for the IncubatorWorks expansion. One of the most successful startups to emerge from these incubators is Silicon Carbide Products, a leader in the creation of ceramic components for coal-fire power plants. The IncubatorWorks team is now speaking with a number of early-stage startups to join the new Horseheads facility. This includes companies in California and Utah that would commit to relocating to Upstate New York. With renovation planning currently underway and construction scheduled to begin this fall, a grand opening is intended for sometime next year. During this time IncubatorWorks will continue accepting applications from startup companies interested in the space. The program also has four Entrepreneurs in Residence, and welcomes other area leaders to participate. NEXT -> Looking for more incubator opportunities? Reach out to the team at Upstate Venture Connect for guidance on mentorship, education and capital resources throughout Upstate New York.